When Bradley Cooper was doing prep work to play a grizzled, heavy-drinking country rock star opposite Lady Gaga in the remake of A Star Is Born, the Philadelphia movie star hung out with his friend Eddie Vedder. The visit was fruitful, Cooper told People magazine at the film's premier in Los Angeles. The Pearl Jam singer offered tips, but only after expressing initial skepticism about yet another remake. "He was like, 'What?,' " Cooper said. "'Bro, don't do that.' "
Vedder's dubiousness was logical. Do we really need another version of a corny Hollywood tearjerker that's been produced three times already, most recently in 1976 with Kris Kristofferson as the boozy rocker and Barbra Streisand the destined-for-stardom protege? That version featured Joan Didion and John Gregory Dunne as contributing writers and cheesy love songs such as Streisand's immortal "love, soft as an easy chair" hit, "Evergreen." The Streisand-Kristofferson version was nobody's idea of a cinematic masterpiece, but that A Star Is Born did have a leg up on Cooper's remake in that both leads were veteran actors who began their careers in music. Kristofferson didn't have to pretend to be a singer. He was one. Cooper is not. But he has to convincingly become one to make the 2018 A Star Is Born work. And he needs to do it while standing toe to toe with an entertainer as experienced and charismatic as Gaga. On the face of it, A Star Is Born also seems out of sync with the movie music trends. The soundtrack, which comes out Oct. 5, the same day the movie goes into general release, is a 15-song set that aims to be a synergistic blockbuster. 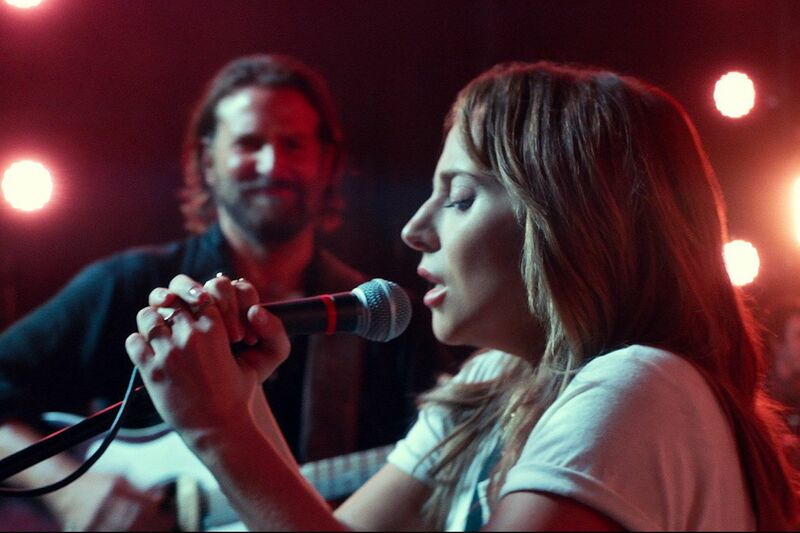 The Gaga power ballad "I'll Never Love Again," delivered at a dramatic moment in the film, seems destined to be an MOR hit reminiscent of "My Heart Will Go On," Celine Dion's smash from 1997's Titanic. In that era, soundtracks played an important function for the music industry and fans hoping to discover new songs. 1994's Pulp Fiction launched Chicago rockers Urge Overkill's career with their cover of Neil Diamond's "Girl, You'll Be a Woman Soon," and compiled a cool selection of vintage surf-rock and soul. Other prime '90s hit soundtracks include Trainspotting, Singles, and Empire Records. That utility as ready-made mixtapes has long since been superseded by digital technology, of course. Where has that left the soundtrack album? Basically, as a medium for musical theater and movie productions that compile songs meant to be heard together in order to tell a story. The list of successes in recent years starts with ingenious hip-hop history lesson Lin-Manuel Miranda's Hamilton and includes Damien Chazelle's La La Land, and two Benj Pasek-Justin Paul show tune collaborations in Broadway's Dear Evan Hansen and The Greatest Showman movie. A Star Is Born is in some ways fundamentally different from those productions. Be relieved, musical haters: It's not the kind of movie in which the characters just stop whatever they're doing and burst into song. But that doesn't mean it's not a musical at heart. Its plot line about dreams of fame, and costs incurred along the journey, is the stuff of theatrical productions from time immemorial, updated for the viral YouTube video age. More to the point, although Cooper's Jackson Maine and Gaga's Ally (she doesn't get a last name) don't just start spontaneously singing for no explicable reason, when they do, they vocalize ideas and emotions that reveal their characters. As Cooper puts it in the production notes, "There's no point in the film where any song is sung that isn't directly related to the emotional moment in the movie in which it is occurring. They're singing words that have only to do with what their fear is, their hope, their dream, in that moment. It's essentially part of the script, but it's not the script." Those words were in most cases at least partially written by the actors themselves. Gaga, who's fabulous in the movie, cowrote all of her songs, and she's musically in a comfort zone throughout, whether fitting her piano ballads into the rootsy song structures of her new boyfriend's band, or getting caught up in the modern pop makeover machine at the behest of her bad guy manager, played by Rafi Gavron, on a career path that echoes Gaga's own rise. Cooper also had a hand in writing several of his songs. More important, he's surrounded himself with a stellar support staff. The movie opens with Cooper as Maine performing in front of a massive crowd. He's woozy from booze but convincingly cranking out a shuddering riff rocker called "Black Eyes." It's gripping, and also loud enough to make it believable that the too-long-on-the-road rocker has a serious tinnitus problem. That song and several others in the movie were cowritten with Lukas Nelson, the 29-year-old son of Willie who just came through Camden with his father on the Outlaw Music Tour. His band the Promise of the Real, which frequently backs up Neil Young, adds a level of serious roots music authenticity. As does Americana hero Jason Isbell, whose "Maybe It's Time" is a forward-thinking thumbsucker about letting the old ways fade into the past, where they belong. It's the first song Ally hears Jackson sing in person, after a character played by Philadelphia-born drag star Willam Belli requests a song at the club where Ally has just won over Jackson with a showstopping take on Edith Piaf's "La Vie en Rose." The soulful, hard-drinking singer is a music movie archetype that Cooper leans on in A Star Is Born. It won Jeff Bridges an Academy Award for Crazy Heart in 2010 and goes at least as far back as Rip Torn in the wild and wonderful Payday from 1972. It's as contemporary as Ethan Hawke's brand-new, quietly stunning Blaze, which stars Ben Dickey, formerly of Philadelphia band Blood Feathers, and which features Kristofferson in a cameo. A Star Is Born works for a lot of reasons, not least because Cooper and Gaga have an unexpectedly sweet chemistry. But the film would have fallen flat on its face if Cooper hadn't pulled off being believable as a still-hanging-on superstar who's a little bit country and a little bit rock and roll. Cooper's performance may not be as Oscar-worthy as Bridges', or, for that matter, Gaga's. And he's not blessed with a sonorous set of pipes like Vedder or current king of country-rock authenticity Chris Stapleton, both of whom seem like source material for the character. But Cooper has placed his tragic hero in a musical setting where grit and falling from grace is prized, and where singing pretty is not a prerequisite of stardom. His voice is plenty good enough to carry the movie's story line, and thanks to his helpmates the songs he sings are certainly better than those sung by the current crop of bro-country dudes who dominate the charts. The idea that excellent Jason Isbell songs are reaching millions of listeners might not be a wholly accurate representation of reality, but in fact it's an improvement upon it. The limitations of Cooper's voice suggest the actor is making the right call when he says he has no plans for a music career. But his ordinariness as a singer also meshes nicely with the movie's plot. It makes it all the more natural that Gaga surpasses him in stardom, because she's clearly more abundantly talented. And no matter how many times you remake it, that's what happens in A Star Is Born.